Personal observations from journeys into many remote Aboriginal communities caused Thunderbird Rising Founder, Lloyd Fournier, to understand that something was wrong – very wrong. He came face to face with the stark reality that young Aboriginal people were taking their own lives at a rate that is at least six times the national average. In reading and talking to experts, it turned out that Lloyd's personal observations are not unique. A recent article in the Vancouver Sun revealed that crisis stretches well beyond the many regions that I had visited. According to the Vancouver Sun, matters are even worse among Inuit youth and the problem is spread right across Canada. Critically high suicide rates are evident in ALL northern Aboriginal communities from northern British Columbia to northern Labrador. Thus, it is evident that the crisis (extremely high youth suicide rates) is unique to Aboriginal communities and becomes far worse as the community is located in a more remote area. As to the suicide problem, it is not that nothing is happening. Governments have pledged reasonable amounts of money aimed at suicide prevention. That is a fact. The reality is that given most of these suicides are taking place in more remote Reserves and Settlements; it is extremely unlikely that money (alone) without the presence of professional interventions will hit at the heart of the matter. Suicide is the product of despair and loss of hope. The problem is an enormous one. Statistics Canada reveals that 38% of the Aboriginal people living inside of Canada were under the age of 15 (1991 Census). Given the level of abject third world poverty inflicted on these communities, there is little wonder that we have a youth suicide crisis. Added to that is another stark fact; a full 54% of young Aboriginal kids are in one form of institutional care or another (Windspeaker) and fewer than four in ten ever make it through secondary school. This then is the context in which Thunderbird Rising came to exist. The immediate response was the assembly of over 400 teachers and community volunteers who amazingly gathered over 40,000 brand new, contemporary classroom text books in matched sets for elementary students in 18 remote fly in communities in northwest Ontario. 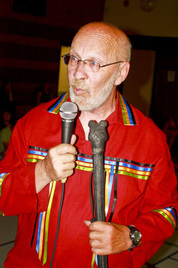 Those books were intended to be a cause of hope among Aboriginal children and to let them know that “Canada cares”. But those books will soon become outdated and worn. The task now faced by Thunderbird Rising is to create awareness and to advocate for fairness in educational funding. Education (especially education at the elementary level) should never rely on charity. Certainly for the audience of over 2,000 who were present during the award presentation were moved by master of ceremonies, Allison Griffiths (award winning financial journalist, bestselling author and experienced broadcaster) in her description of Thunderbird Rising’s achievements and the crisis conditions facing Aboriginal youth. A small step towards awareness and hopefully a step towards a sustainable solution. You too can help by simply making others aware.